The newer construction architectural home at 10365 Mississippi Ave., LA CA 90025 received a price reduction this week of 10.73% or $300,000, down to $2,495,000. The home was listed 42 days ago for $2,795,000 and this is the first price reduction of the listing term. Now that the Westwood Hills architectural home at 151 S Bentley is in escrow, this is the only completed architectural home available on the market in Westwood. 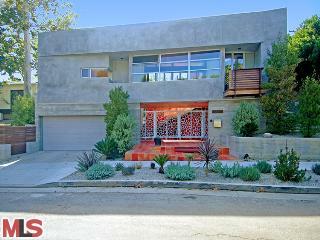 Just south of Wilshire, there is one other architectural home for sale on Kinnard. Its currently unfinished and its listed for sale at $2,795,000. Its about ~4,200 sq ft and will have a 3 car garage with a guesthouse on top, when completed. Back to this house on Mississippi...according to the MLS, this home is a 3 bedroom / 3.5 bath, 2,800 sq ft of living space on a 6,316 sq ft lot. Not only is this house an architectural style home, it has a laundry list of "green" features. Last thing I will mention about the home is if you have never been in this pocket of homes, north of Olympic and east of Beverly Glen, your missing out on a quiet, hilly, tree lined section that makes you feel like your outside of LA.